About - Encore Trucking & Transport Ltd.
Encore Trucking & Transport Ltd. is a family business formed in 1981 by Frank Lucas. Frank’s sons, Don and Jim, came into the business in its infancy. Initially Encore was an oil patch hotshot outfit, running tools to drilling rigs, parts to plants and working for oil well supply companies. 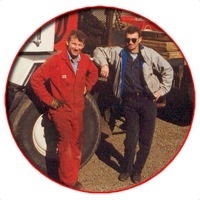 As Encore acquired more one ton trucks and trailers, it found business with the newly developing drilling industry, started hauling core barrels, did some winching, and in the slow times found the odd construction related job. Encore’s first crane was an Atlas 3006 with 19’ of reach, and then in rapid order: a Tico 4-ton, a 5-ton Viva and an old top pull 8 ton National (their first straight boom). Encore grew out of the one ton business into the single axle 5 tons. Our maturing trucking and crane company needed more power, better platform and higher weight capacity. Encore eventually switched to diesel powered tandem units & rigged them with good cranes and good people. Following Encore customers leads and demands, their cranes grew in capacity. In 1994, they purchased their first tandem-tandem with a 40 ton monster folding crane. In 2000, they purchased another one and over time acquired other trucks with cranes of various sizes and uses to suit customer needs. Once Encore acquired the cranes and trucks, they began to develop customization’s and gear to help their customers work easier and more efficiently. At Encore Trucking & Transport Ltd. our mission is to provide the best transportation, specialty lifting service and rentals to our customers for our scope of work in Western Canada and beyond. At Encore, we have 2 separate divisions. Encore Trucking & Transport Ltd. and Encore Rentals & Sales. Encore Trucking & Transport Ltd. is our crane, picker truck and transport service division. We do straight and knuckle boom work, jack and roll, man-basket projects, confined space work and anything else that needs lifting or hauling. Encore Rentals & Sales is our mini crawler crane (UNIC Spydercrane) rental and sales division. These unique units have added tremendous flexibility to our lifting capabilities and are a perfect fit for a company already known for specialty lifting services. Encore Trucking & Transport Ltd. is committed to ensuring that your privacy is protected. Should we ask you to provide certain information by which you can be identified when using this website, then you can be assured that it will only be used in accordance with this privacy statement. This policy is effective from January 2012. We may collect the following information when an individual chooses to fill out one of our online forms: name, address, email address, phone number and/or resume information. We require this information to provide a quotation to you or to consider your application for a job opening at Encore Trucking & Transport Ltd.
-We will never provide your information to any third parties for marketing or promotional purposes. -We will never sell your information. Our website may contain links to enable you to visit other websites of interest easily. However, once you have used these links to leave our site, you should note that we do not have any control over that other website. Therefore, we cannot be responsible for the protection and privacy of any information which you provide while visiting such sites. You should exercise caution and always protect your personal information. If you would like to receive a quote, book a job, rent a mini crane or just have some general questions please give our dispatch a call today or fill out our inquiry form.